I’ve never been on a protest march before, but I bet the one I am attending today is a little unusual. 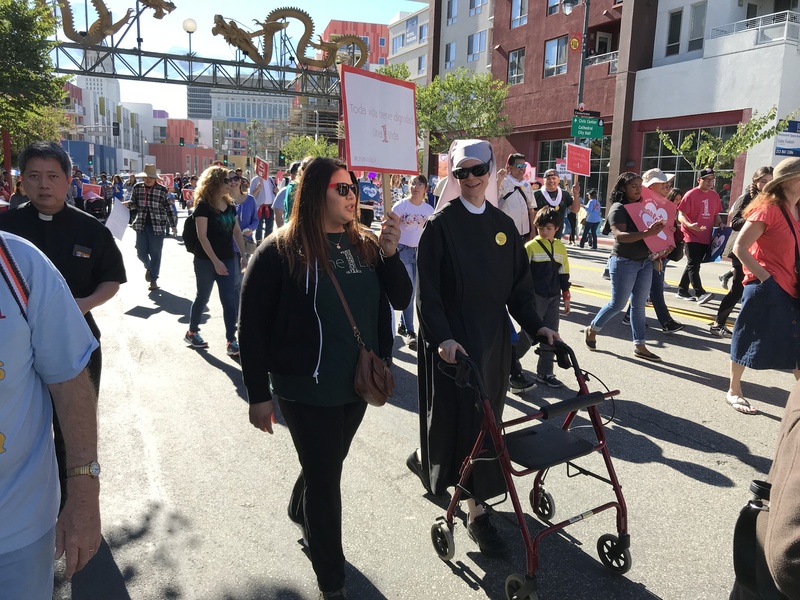 I see little kids in strollers, seniors pushing four-wheeled walkers, perspiring retirees carrying Knights of Columbus banners, and a group of Hispanic teenaged boys wearing matching T-shirts with hearts. Scattered throughout the long line of marchers, people are carrying Our Lady of Guadalupe images emblazoned in bold colors. The nuns are the classiest, wearing full habits in the blazing midday sun, and yet also the loveliest, most serene smiles. Sometimes a group of marchers break out in a Rosary chanted in unison. I see lots of signs of every shape and color, many homemade, but sending a unified message, “Recuerda a los no nacidos,” “Mom and Dad for life,” “women deserve better than abortion,” “made for greater love,” and “love life” (the message on the hearts of the teenagers). This is the fifth annual “One Life LA” march on Jan. 19, proceeding from La Placita Olvera to LA Historic Park. The mission, according to LA Archbishop Jose Gomez, is “to unite communities and inspire positive action through an annual event that promotes the beauty and dignity of every human life from conception to natural death.” It started in 2015 with 15,000 participants and grew to 35,000 last year. This year the march concludes with a fiesta in the park with speakers and music. I don’t make it to the party as my little nephews get tired and barely make it to the Metro station located a block before the end of the march route, but I’m glad I make the march. It may not be politically correct to be ProLife, but I feel happy and peaceful inside to march alongside these people. Having a severe developmental disorder myself, it just feels good to be with those who, from the curmudgeonly senior knights to the serene nuns to the grinning troupe of teenagers, would have rooted for me and my mother for me to be born. In a time where voices of despair are everywhere encouraging moms to seize their right to end an unwanted pregnancy, it’s nice to hear a gentler voice encouraging the hopes of moms to love the lives they harbor within. We can’t live in an echo chamber. It’s a healthy thing in this country that we can bring many voices to the table, which is what OneLifeLA is all about.